Description: Technically this concert series kicked off in March, but it’s still a not-to-be-missed attraction happening every Wednesday afternoon in April. Venture out for great food and fantastic outdoor concerts performed by a series of well-known artists. Featured musical styles are diverse, and include jazz, rock, funk, swamp pop, Latin, and more. The remainder of April includes these artists: Flow Tribe, Wayne Toups, Darcy Malone, Big Sam’s Funky Nation, The Deslondes, and more. Concerts start at 5pm and run until around 8pm. The area directly in front of the stage is reserved for dancing, but the rest is open for chairs, blankets, (leashed) pets, and whatever else you need to enjoy a great open-air concert. Food booths and concessions are staked out around the park to offer concert-goers a range of food options, as well as beverages (alcoholic and non-). This is Louisiana’s largest free music festival. 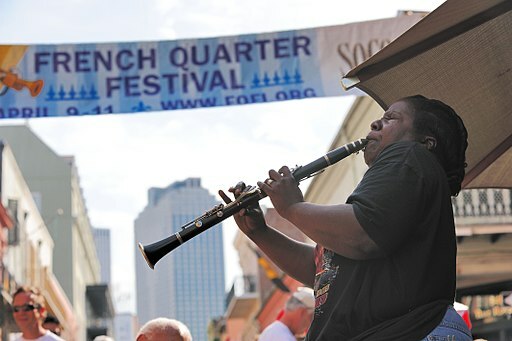 The three-day weekend will feature musicians playing at 20 different stages located within the French Quarter. Local musical styles like Cajun and zydeco will be on display, as well as funk, jazz, R&B, rock and more. Over 100 New Orleans-based performers will take the stage over the course of the weekend, and more than 300 musicians in total. There will even be a new stage set up on the 100 block of Bourbon Street, where the second line parade kicks off the festival at 10am on April 12th. This year also marks the 35th anniversary of the festival, so it’s sure to be a good one. And don’t miss the festival’s signature event: the “world’s largest jazz brunch” in Woldenberg Riverfront Park and the French Quarter, where attendees will get to sample affordable helpings of the city’s best dishes from our legendary restaurants. Historic ships from the US and the Netherlands will sail into New Orleans this April, docking along the Mississippi Riverfront. Thanks to NOLA Navy Week, a fleet of navy war ships will accompany the sailing ships, gracing the river’s edge for the weekend. Hang out and admire their history and beauty, climb aboard and take a look around, sign up for a sail, or attend the Tricentennial Gala for an evening of on-deck and dock-side music, rum and fireworks. This is an annual music, food and art festival at Tulane’s Uptown campus. There’s plenty of live music and dozens of food and art vendors, but this event is best known for serving up unlimited crawfish for the day. And in case you were curious, that typically amounts to over 20,000 pounds of crawfish. Jazz Fest has got something for everybody. There’s a ton of great food, a wide range of fantastic music, lots of handmade arts and crafts, second line parades, and more. The festival runs 12 stages, with dedicated tents for gospel, jazz, blues and kids music. Headliners this year include Aerosmith, Sting, Rod Stewart, Jimmy Buffet, Lionel Ritchie, Sheryl Crow, Common, Beck, and so many others. All of the usual suspects will also be there, performers like Irma Thomas, all the great NOLA brass bands, Kermit Ruffins, Toots & the Maytals, the Neville brothers, Ellis Marsalis and Trombone Shorty. Now you know what local treasures April holds in store for you, be sure to check out one, two or maybe all five of these fantastic events!